Stanford in the Western Cape Overberg is one of the most beautiful villages in South Africa, with wonderful scenery, amazing people and many quirky characters! When the village turned 150 in 2007, I wanted to capture the human face of the village in its 150th year. So, in June of that year, I started taking photographs of “some” people in Stanford and doing research on the village’s history. 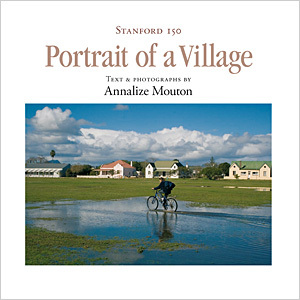 After 4 months and thousands of photos, this resulted in a well-received exhibition in October 2007 and the publication of the large-format book Stanford 150: Portrait of a Village in February 2008. A selection of the photographs have been exhibited at various venues in South Africa, Holland, Germany and Italy. And with life, also the life of a village, being organic and ever-changing, I shall endeavour to, through the blog, And life goes on… and the facebook page, Portrait of a Village, keep readers up to date with LIFE in Stanford! If you yourself are a born and bred Stanfordian, or an “inkommer” like me who is passionate about the village and its people, or just a lover of the village, and you have stories and/or photos to share, please do so! We’ll be delighted to publish them here and on our facebook page. Should you want to purchase photos or the hardcover book email me via the contact form! Thank you so much, Jacqui! Annalize your work on this book will always stand out as the greatest historical contribution and achievement Stanford has ever known. You are an inspiration. Thank you.